New year, new series! To start off 2017 right, I decided to put more on my plate and foster my love for cosplay, so why not start a casual cosplay series? I’ve seen so many of my fellow geek bloggers partake in casual cosplay, and I have definitely dabbled in it from time to time. For those who do not know the fine art of casual cosplay, it’s basically a way to dress as nerdy as possible in your everyday life. By taking pieces from your wardrobe and combining them to make an outfit that represents a fandom or character, you can transform a boring outfit into an extraordinary ensemble. I love that it fosters creativity and nerdiness, and it’s super fun to come up with looks that represent things we love. For 2017, I decided to create a challenge for myself: have at least one casual cosplay outfit that revolves around a central theme each month. After a few brainstorming sessions, I came up with Casual Cosplay of the Day. If you decide to do this with me, make sure you use these special hashtags so I can see your creations: #ccod and #nerdilyccod. I’ll keep an eye out on Instagram, Twitter, and Facebook to see what you come up with. And remember that this is open to ANYONE! Now, on to January’s theme: Sherlock. Since season four started this month, how could I not make January Sherlock-themed? There are so many great looks and characters to emulate that it should be a no-brainer to create an ensemble if you’re a fan. My look for this month is inspired by Dr. John Watson. 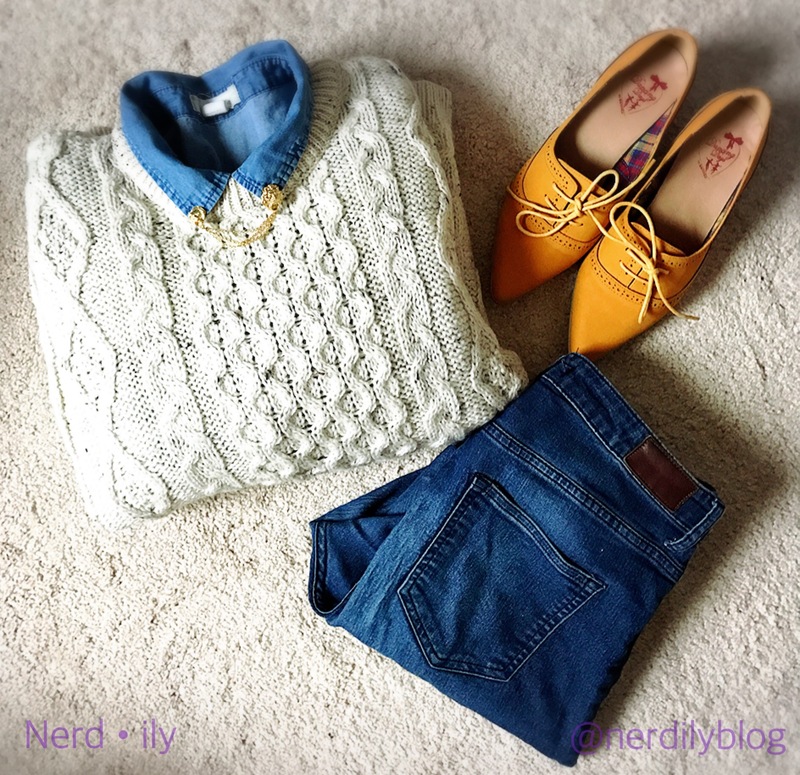 Big, comfy sweaters, basic layering pieces, and feminine menswear make up the basis for this look. In the show, Watson is known for wearing fluffy cable-knit sweaters, so I busted out my very own I picked up in Ireland. This is a great outfit for a Chicago January as it tends to get rather frigid. 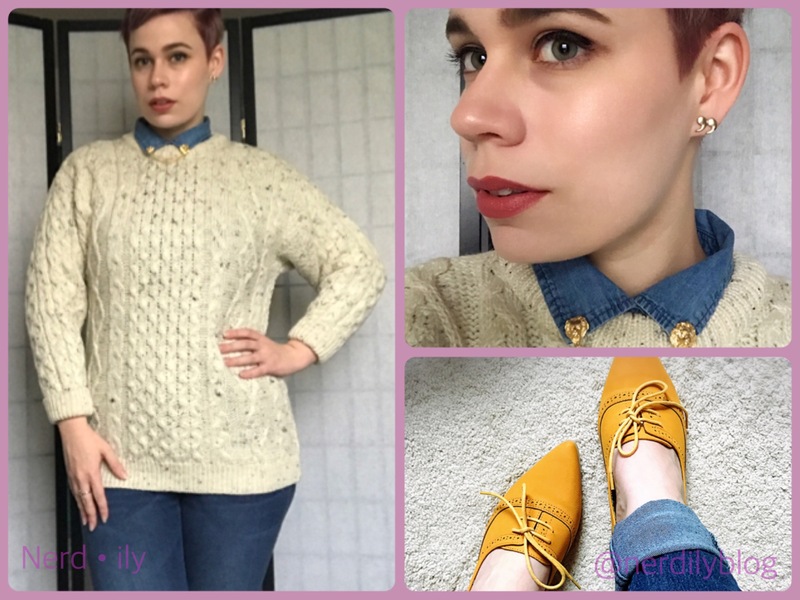 I layered this sweater on top of a denim collared shirt, and paired these pieces with my favorite jeans. My shoes are reminiscent of oxfords, which I’ve seen Watson wear on multiple occasions in the show; this pair adds some femininity to the overall look, and a pop of color. 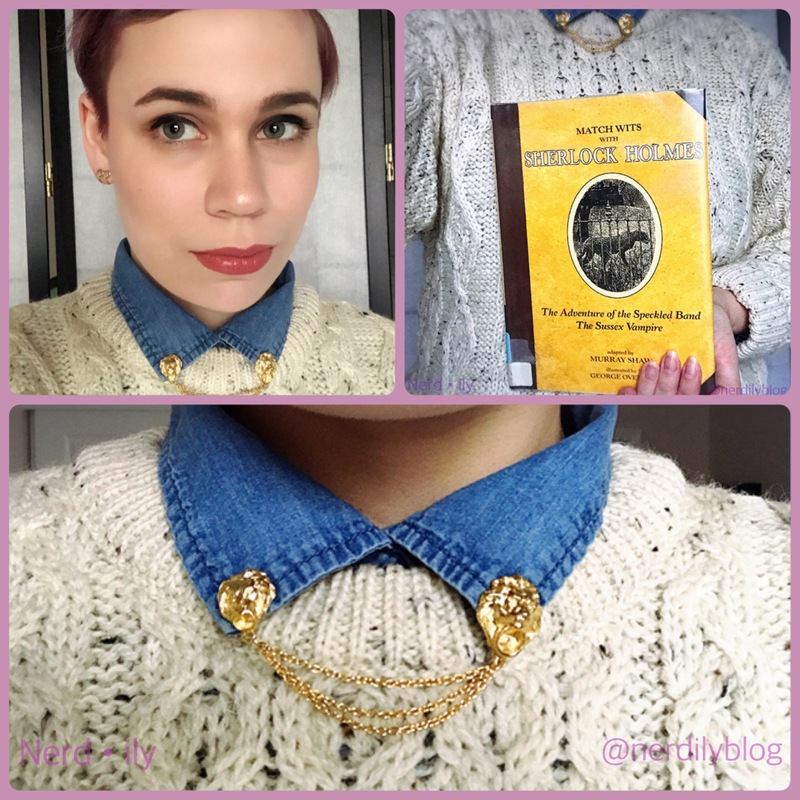 For accessories, I wore my lion collar pin, since Watson is lion-hearted. I also put on my quotation mark earrings to appeal to Watson’s tendencies to chronicle his and Sherlock’s adventures. My makeup is simple and neutral, with a petal pink lipstick, sheer countouring, warm highlights, and gunmetal eyeshadow. As an added touch, I grabbed my favorite version of the Sherlock Holmes stories, which is the actual version I read when I was in 4th grade and first discovered these stories. Think moody colors like blacks, greys, deep purples for characters like Sherlock and Mycroft. Watson and Mary dress quite normal, but Mary, Molly, and Mrs. Hudson tend to wear more florals. Irene Adler commands well-fitted garments like pencil skirts and A-line dresses, and is part of the well-tailored crew with Sherlock, Mycroft, Lestrade, and Moriarty. Also, anything with a Union Jack on it is a safe bet for a Sherlockian look. It’s your turn, now! 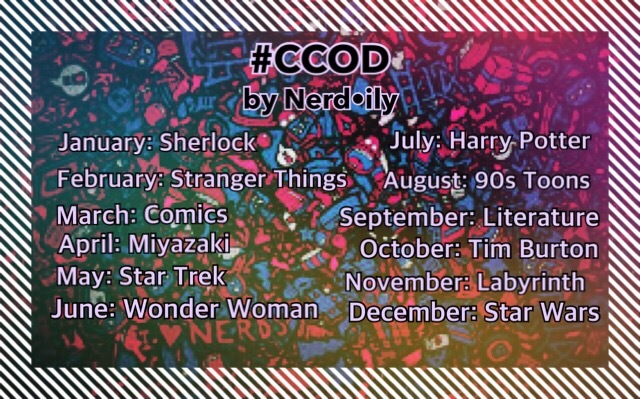 Remember to use #ccod (Casual Cosplay of the Day) and #nerdilyccod so I can see your outfits! I’ll post mine here and on Twitter, Instagram, and Facebook. It’s time to make 2017 ad nerdy as possible! Love your look, and it is just perfect for Watson!